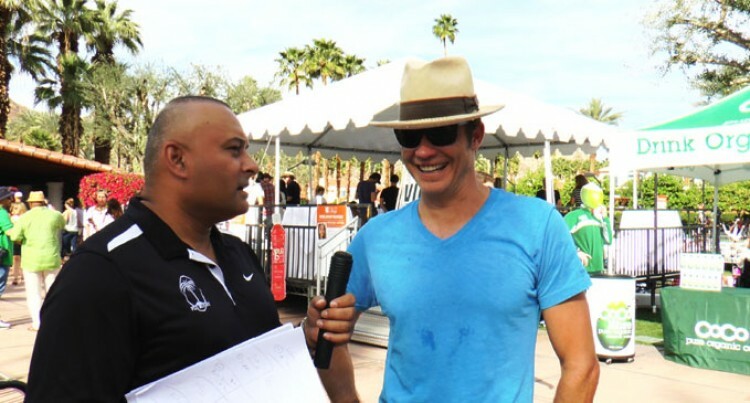 Ajay Bhai Amrit (left), with Timothy Olyphant. Timothy Olyphant might not be a household name in our region, but in America and in many parts of the world he is revered for his lead roles in two hugely successful and internationally-acclaimed television series. The first was the more adult-themed prime time evening show, which ran in the States and worldwide for three seasons. The name of the show was “Deadwood”. This show won many awards for its originality and hard-hitting drama. The series was based around the Wild West days in America in the 1870s and portrayed the lawlessness and reality of living in this bygone era. Timothy’s role was one of a hard uncompromising enforcer. The show picked up many awards, including eight Emmy Awards and a Golden Globe Award. Timothy was credited for being the lead actor who made this show hugely popular. The second role Timothy Olyphant is well known for the American hit television drama series “Justified”. In this show he plays a tough U.S. Marshall enforcing his own brand of justice in his hometown of Harlan, Kentucky. The tough and sometimes unorthodox justice that is handed out by Olyphant is certainly riveting viewing. This prime time TV show is running in its sixth year and has won numerous awards during this time. Timothy once again is the central character of the series. Timothy David Olyphant was born in May 1968 in Honolulu, Hawaii. His father was a college professor who worked in a winery and he is a descendant of the billionaire industrialist Vanderbilt family, who a century ago where possibly the richest family in America. CNN’s News anchorman Anderson Cooper comes from the same family. Timothy had a very happy childhood and excelled in swimming, which he trained every day for. After leaving school and securing a spot at the University of Southern California he continued with his swimming and was nationally ranked throughout America. At university he excelled in fine art studies. At the same time he decided to take acting classes as well and slowly started enjoying this profession. After finishing university and rather than continue towards a Masters degree in fine arts, Timothy moved to New York to study acting and landed a few roles in theatre. This eventually led to television work and then the opportunity came around for him to be part of the hugely successful drama “Deadwood”. The hit series “Justified” followed this and, as they say, the rest is history. I interviewed Timothy Olyphant and what is quite striking is his real life persona is that he is nothing like what you see on television. In both his acting roles in “Deadwood” and “Justified” he is a sadistic and super hard hitting character with no mercy and yet to interview him is like interviewing a shy gentle and reluctant hero. I should know better than most that Hollywood is a town of smoke and mirrors and make believe, but to have a person who is such an opposite to his television character certainly caught me offguard. Just like any regular guy Timothy is married, in fact he has been married for the past 24 years to wife, Alexis, and they have three children together – daughter Grace, who was born in 1999, followed by son Henry and another daughter Vivian. The family live in Westwood, Los Angeles, which is convenient for family upbringing and Timothy’s work as an actor. Timothy Olyphant is certainly a gentleman of the first order and shared many of his experiences with me.